The purpose of this game is to sink all the enemy ships. You and the PC first arrange ships in an area, and then will take turn to bomb each other's ships. Since you do not know the location of each other's ships, you need to bomb strategically in order to be as efficient as possible when bombing the ships. Version 1.7.2 is a freeware program which does not have restrictions and it's free so it doesn't cost anything. For security reasons, you should also check out the Battleship download at LO4D.com which includes virus and malware tests. Additional screenshots of this application download may be available, too. Battleship has a presence on social networks. 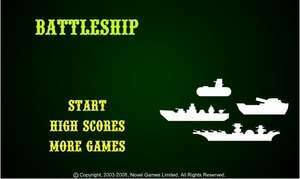 Battleship download been highly rated by our users.